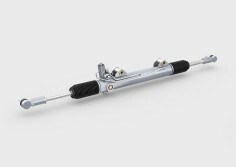 With the engineering of the truck base rack-and-pinion steering system, tedrive has succeeded in adding a toothed rack version to the established recirculating ball steering system for heavy commercial vehicles and thereby not only significantly optimized the steering precision and fuel consumption, but also safety. The truck rack-and-pinion steering system developed by tedrive provides the driver with a significantly improved steering feel, as the steering linkage of conventional recirculating ball steering systems is directly replaced by the rack-and-pinion steering system. Furthermore, this also means that the number of components required can be reduced, with the resulting significant savings in weight and costs. tedrive has developed various concepts which enable the use of rack-and-pinion steering systems for both rigid axles and independent wheel suspensions. Through the use of the modular tedrive steel housing technology, the steering systems can be operated at higher pressures. The sturdy steel design can withstand a bursting pressure of >400 bar. This means that the minimum volume flow rate required in the steering system can be reduced. The result of this is a noticeable reduction in fuel consumption, which contributes towards optimizing the overall CO₂ balance of the vehicle.